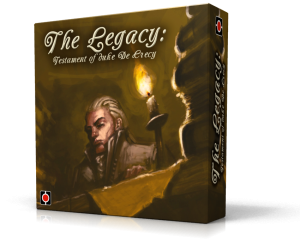 Legacy (or Legacy: Testament of Duke de Crecy to give it its full name) is a very innovative game where players try to create the most successful 18th century family starting with a single family member. Each round, players use their actions so that the current generation can get married, have children, buy mansions, start business ventures, arrange marriages for their children, etc. After a fixed number of rounds, the children grow up, any arranged marriages take place, and they become the current generation. Players then use actions for this new generation to get married, have children, etc. After the 3rd generation’s actions, the game ends and the player with the most points (Honour) wins. Legacy: Testament of Duke de Crecy is a game where players create a family tree and try to create the family with the most honour. The game looks innovative as players grow their family tree by placing cards in a tree-hierarchy. Each player starts with a couple who can have children who then get married, have children, buy mansions, and so on. In each round, the gameplay is focused on the latest generation of family members. So, children born from a generation in one round grow-up and become the focus of the actions of the next round, having their own children, etc. The heart of the gameplay is a worker-placement game. 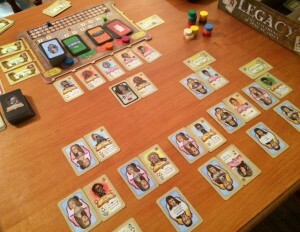 Players place action markers on their own personal actions (marry, have children, socialise, ask friends for money) and on action areas on the main board which any one player can use but these are first-come, first-served (acquire title, hire fertility doctor, buy mansion, initiate venture, undertake mission, and contribute to community).